This past weekend I was deeply blessed to be part of the inaugural Missional Voices conference at Virginia Theological Seminary, a weekend to bring together a diverse group of people from across the Episcopal Church and dream and share about ways of incarnating the gospel in our diverse communities. From the keynotes to the panel discussions to the new friendships, I feel full, loved and cared for. I was also excited to be an artist in residence for the conference tasked with digital visual note-taking and leading a small group time on Zendoodles (Zentangles). I wanted to make a blog entry on some of the things I produced as a digital visual note-taker, and introduce you to some exciting people I met in the weekend. Ginny Wilder… Um, I’ve already started my Apple Music playlist of her stuff. Yes, she’s a singer songwriter currently working on her 7th studio album and has some of her stuff in the iTunes library. I didn’t know all that when I met her on Friday. I think we were just standing around before dinner outside the refectory having cold beers, finger foods and soaking up the long-awaited sunshine of a late-in-coming Spring. We started chatting and I noticed she wears the same James Avery wedding band I wear… BFF zone. She has a YouTube channel and is currently raising money for her next album. Stephanie Spellers… Stephanie Spellers is an author and the Canon to the Presiding Bishop for Evangelism and Reconciliation, and a really cool lady. She was a keynote speaker at the conference and a leader in the worship sessions. There were so many more like Alan and Christian, who started the idea rolling for the conference and worked so hard to make it happen. And there was Jason Evans, a good friend and Missioner for the Episcopal Diocese of Washington. I was making some digital art! I’ve done the visual note-taking thing with white boards and markers, and I’ve done live painting in which I weave the themes of worship and the speaker(s) into the canvas… this weekend was a hybrid of the two and I really enjoyed it. Looking forward to next year! Missional Voices 2017! 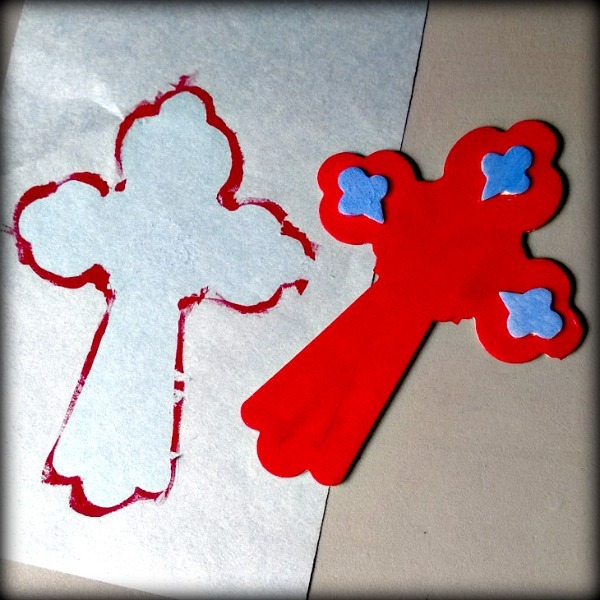 This entry was posted in Art, Making Art, Note Taking and tagged Art, Missional Voices, Note Taking. It’s such a shame that breakfast is a finite quantity and experience. 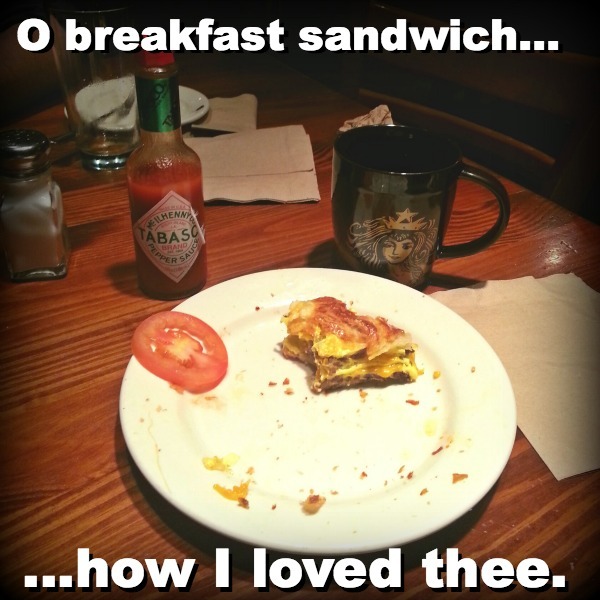 One moment I was enjoying an absolutely amazing breakfast sandwich here at La Madeleine this morning, and then it was gone. Why wasn’t I taught that breakfast was finite? Why wasn’t I prepared for the consequences of eating? Yeah, I’m so not really writing about the finite’ness of breakfast. I’m actually writing about the finite nature of creativity. I’m discovering in myself and my own life that creativity is in fact not in infinite supply. It seems I was raised with the expectation that creativity was a bottomless well, a super power without limits, something to be tapped, mined and spent with abandon. I believe I’ve experienced just the opposite. I’m not saying that you may not have a creative super power that goes on and on (although I don’t believe you do, hehehe), but my well can run dry. And I’m not just talking about those times of life that are creatively a bit dryer than other times. I have noticed that when I choose to invest my creativity too heavily in one direction and pursuit, I simply don’t have the juices to move in another direction. It’s really disappointing. 2) anyone who says your creativity is infinite is selling you something, a product or a service. What all this means for me is that I must do some reflection and self-analysis periodically in life to make sure I’m not wasting my creativity. I need my creativity in my work and career. I need my creativity in several career related pursuits in my life. I want to be a creative husband and father. If I’m investing my creativity in pursuits and activities that do not channel into these important areas of my life, then I’m going to come up short when I need it the most. One of the biggest culprits in my life is video gaming. Video games in their various forms can be amazing creative outlets, at least the ones I’ve chosen to play. From Minecraft to World of Warcraft to Second Life, I am invited to create characters, build worlds and fashion whole realities from pure imagination and creativity. All the games I mentioned offer various kinds of rewards for spending my creativity there, and none of them are bad, evil or inherently wrong. I know, I know… who wants to read a 43 year old man-child blog about spending too much time playing video games? It’s not just video games. I can do this with movies, Netflix and going on a TV binge. I can do this with hobbies and other pursuits in life that do not help me channel my energies and pursuits in the direction I need to be moving or simply a direction that is producing usable returns for my life. This whole finite creativity thing may also have an impact on my tendency to be a “starter” but not always a “finisher” as I change my spending habits midcourse with projects. Maybe it’s the natural outgrowth of an addictive personality. Today, I’m making some lists. I’m making some lists of unfinished work projects, current hobby activities, upcoming creative needs and unmet life desires, and I’m going to toss those lists into a mixed salad of opportunities for spending my creative reserve, and prayerfully try to make some wise choices. Honestly, I’ve been doing this for a few days now, and am committed to continuing the exercise. Thankfully, as finite as my reserve of creativity may be, it’s also a replenishing resource. My mistakes aren’t my future and the well that ran dry will run again. This entry was posted in Art, Just Life and tagged Art, Breakfast, Creativity, Finite Creativity. Almost two years ago I’m at a conference in Albuquerque, NM, and I hear a dream being described for a festival built on the idea of allowing streams of life like art, justice and faith to freely create a nexus point, an intersection of creativity and action. Really, they had me at the word festival. Festival is a noun that the esteemed Merriam and Webster say means “a time of celebration marked by special observances, a feast, and an often periodic celebration or program of events or entertainment having a specified focus.” (Pulled right from http://www.merriam-webster.com!) My imagination immediately presented me some mental images of a feast of art, an observance of justice and a celebration of what happens when we give free reign to those streams to mingle and dance together creating new things. I wanted to be there to see that, to hear that, to taste and hold it. I volunteered to keep in touch with the dream and friended the fledgling Facebook profile, and I began to dream myself of the coming feast. Today I’m a part of the planning to make art happen at the festival. We are dreaming of canvases and paints, clay and paper. We will use our creativity to vision changes in ourselves, our communities and our world. We’ll bless the land and the people which play host to us in the four-day feast. Making art is an a tangible expression of the spiritual streams running through our hearts and souls. Making art is presence. Whatever your past experience of art has been, we will help make an exercise of creative expression very accessible for you. This won’t be a time for seeing who is an “artist” and who isn’t, but it will be a time for each of us to dig deeper into the creative veins which God has implanted in all. I can’t know where your hungers are or what kind of feasting you need. But I know that tables are being prepared for us. We will sit down together and share a rich fare as our faith, our dreams and needs for justice, and our creative hearts all come together for a few days in North Carolina. And if Merriam and Webster are correct, this will be just a beginning of a many more feasts to come and we make a community chasing the Wild Goose and making time together for years to come! I hope to see you there! This entry was posted in Devotional Thoughts, Just Life and tagged Art, Justice, Spirituality, Wild Goose Festival.